I gave the children some grid paper and pattern blocks, then told them to draw a line somewhere close to the middle of their paper. This line would be their line of symmetry. 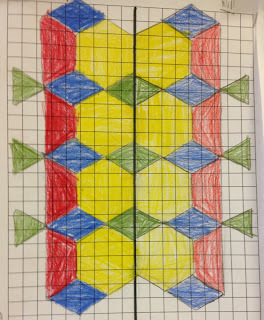 They created a design along their line of symmetry by tracing the pattern blocks and coloring them. 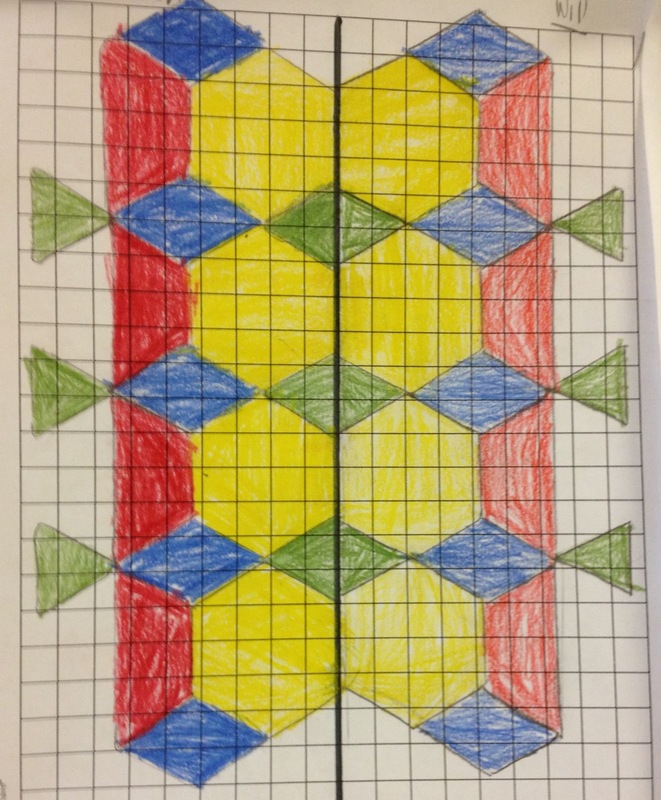 After they finished, they traded papers with a partner, and their partners finished the drawing by making a mirror image on the other side of the line of symmetry. 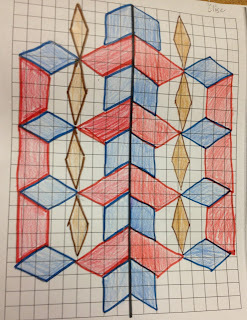 There was some great discussion, especially in regards to the blue rhombus. 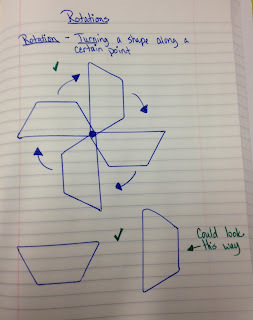 The kids had to consider how that shape would look when flipped over. 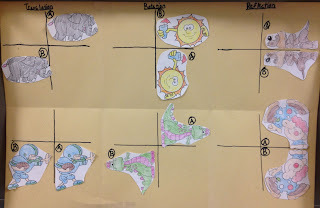 After our lesson on transformations the day before, the kids used cartoon pictures to model each type of transformation two different ways. The reflection was a little more challenging. 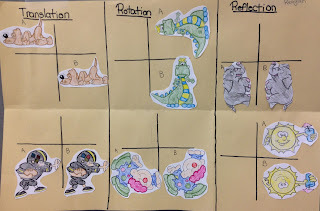 The kids had to figure out they needed to trace the shape through the back of the page to model a reflection. Love that logical thinking!!! 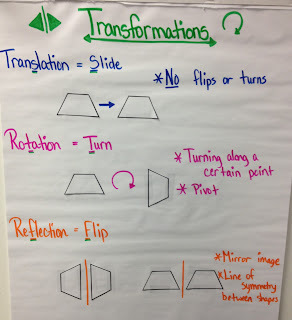 A geometrical transformation is simply the changing of an object's position. 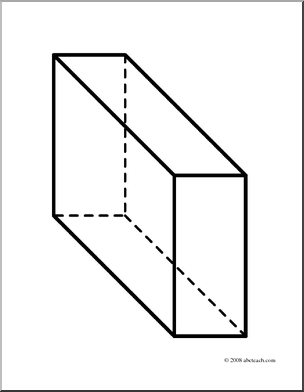 The size and shape of the object do not change, only the position. 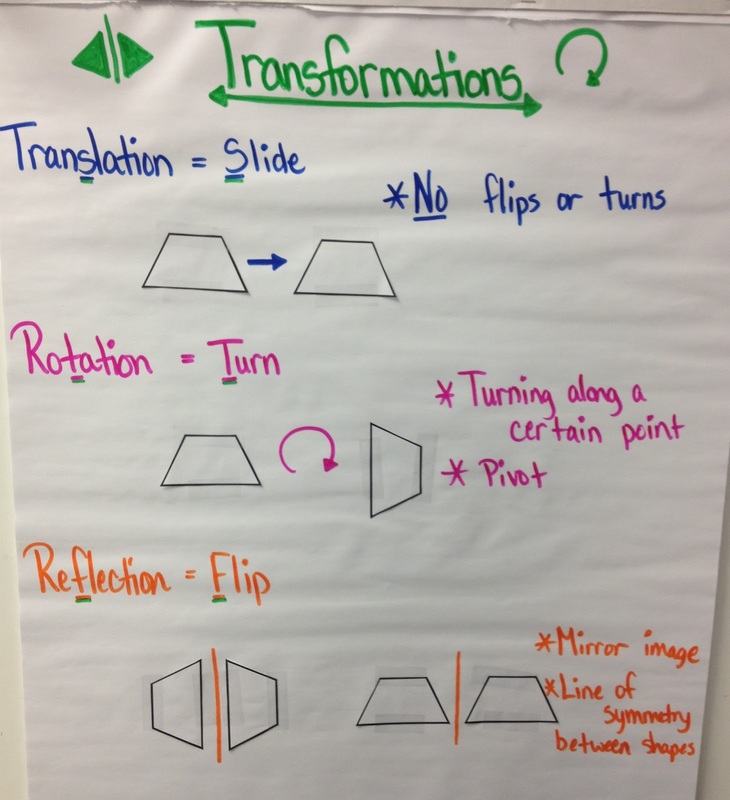 There are three types: Translation, Rotation, and Reflection. A translations is a slide. There are no flips or turns. A reflection is a flip, or mirror image. 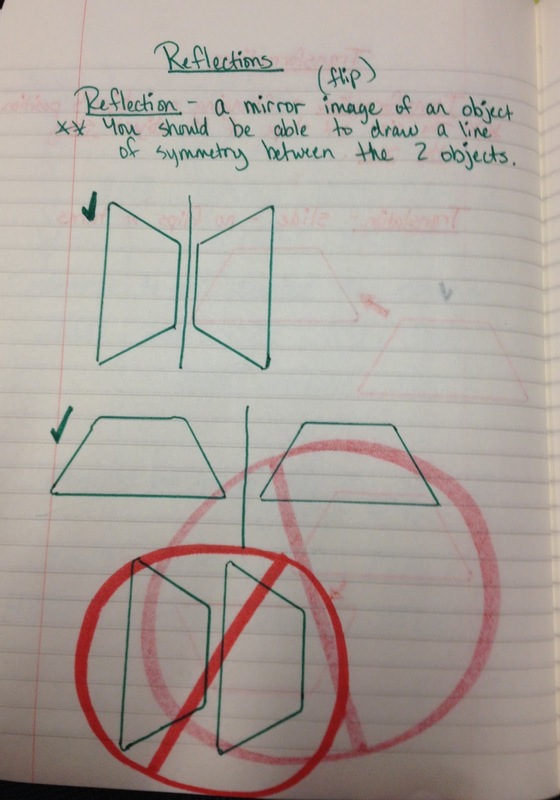 If it is a reflection, we should be able to draw a line of symmetry in between the shapes. A rotation is a turn along a certain point. 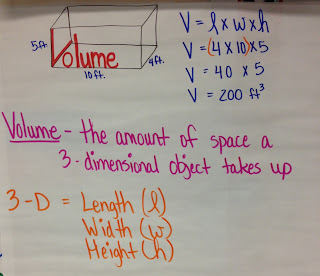 We introduce volume by looking at different shapes made out of linking cubes. 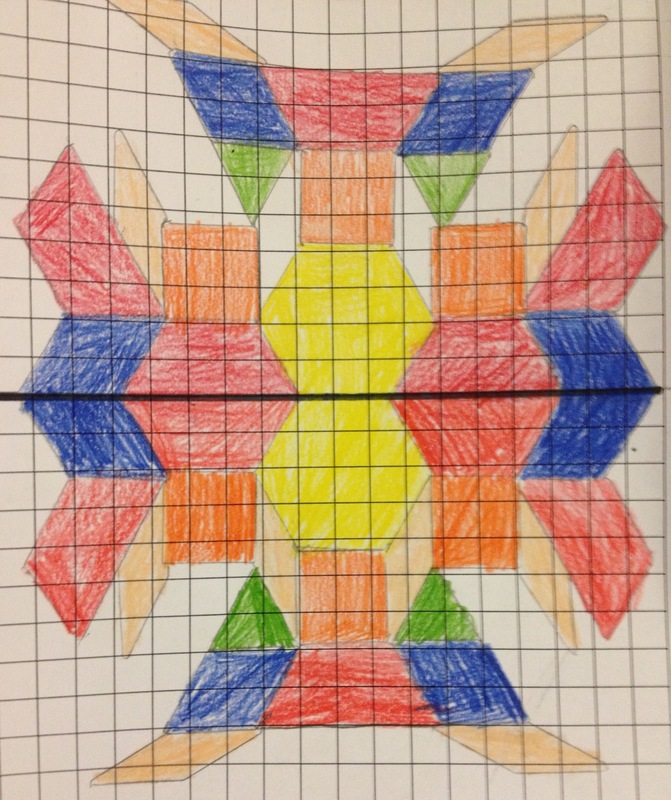 It's an exploration to determine the best way to count the number of cubes within the shape. We discuss ways to keep ourselves from counting the cubes more than once. It's an easy mistake to make when looking at the cube from different angles. The best way we came up with was to look at the shape in layers. 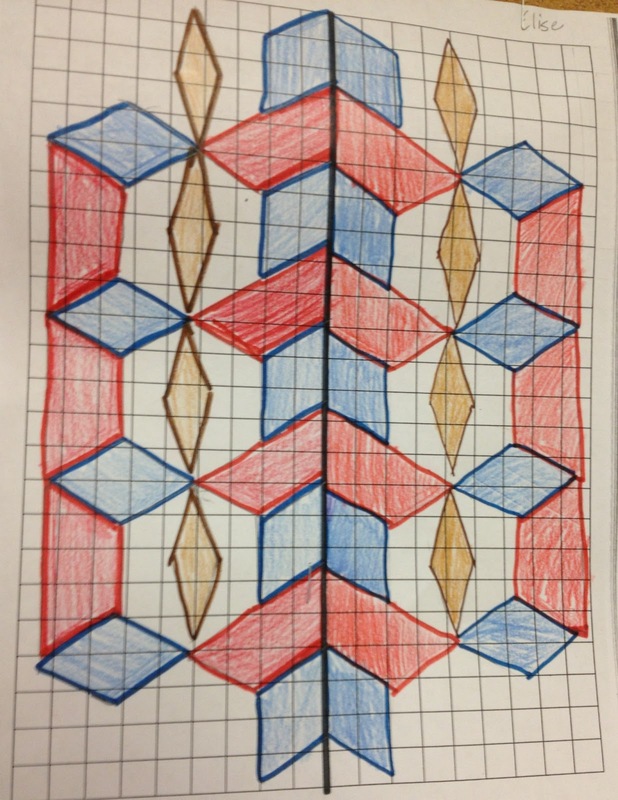 Figure out the number of shapes in the initial layer, then determine how many layers there are. This leads the kids to self-discover the formula V = L x W x H. They usually pick up on this very quickly. Today the kids went on an angle search around the school. They paired up and used iPads to take two pictures of acute angles, two pictures of obtuse angles, and two pictures of right angles. Here are just a few of our pictures. After finding the pictures, the students used the app Educreations to create a movie slide show with narration telling about each angle. For example, when an acute angle is pictured, the kids can be heard saying, "This is our example of an acute angle. 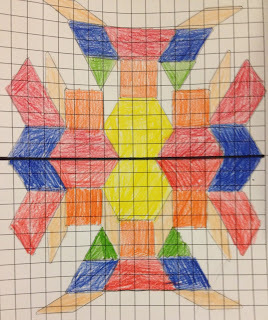 Acute angles can measure from 1 degree to 89 degrees. We estimate this angle to be about 45 degrees." 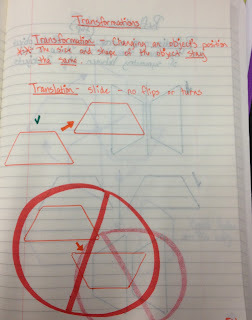 This is an example of our journal page for 3-D shapes. 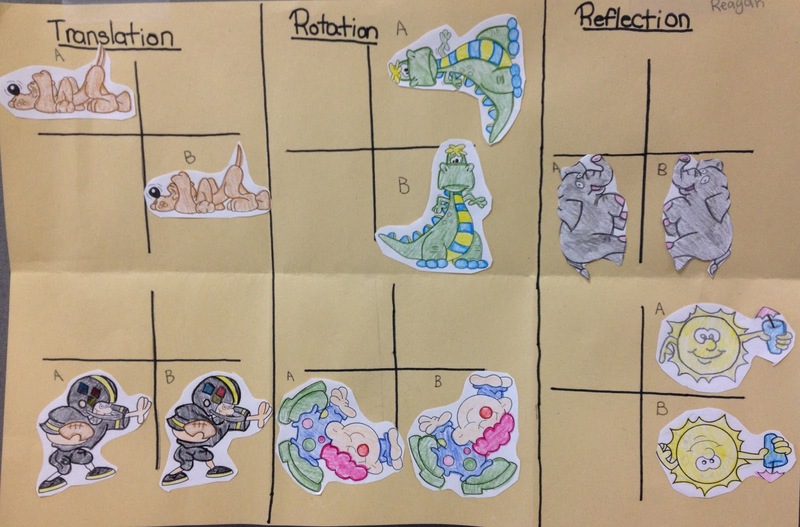 By 4th grade, most kids are pretty aware of the attributes of 3-dimensional shapes. I do usually have couple of misconceptions to clear up. 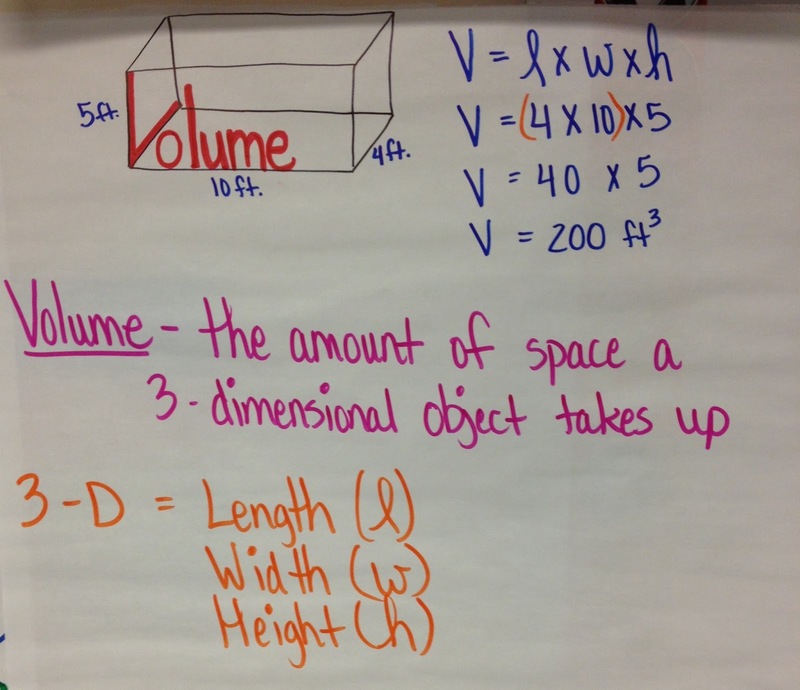 The first is that this is a rectangular prism. This is actually a square prism. 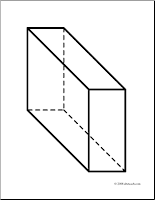 Prisms all have rectangular faces around the middle. It's those two side faces that tell us it's name. The second misconception is that bases are the faces on the bottom of the shape. Actually, bases only exist when the shape has a curve. 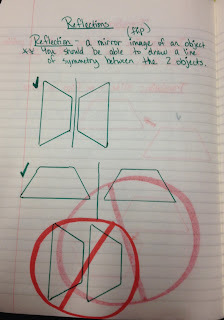 The only shapes we discuss with bases are cylinders and cones. 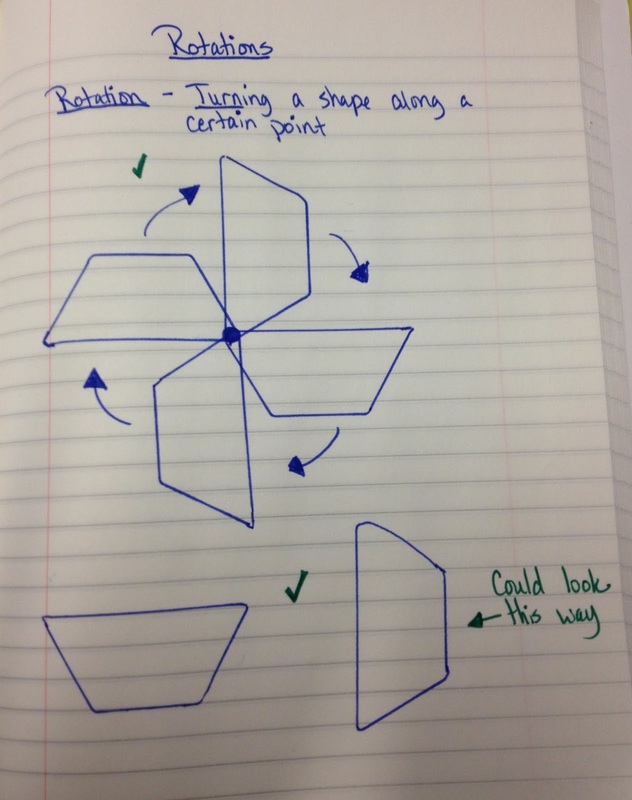 We continued our discussion of polygons by combining two or more polygons to make a new polygon. 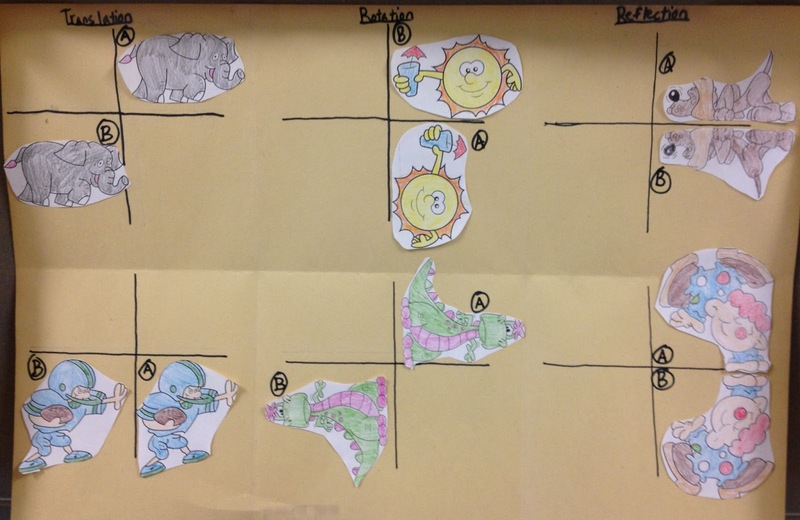 We listed examples and non-examples, then made some examples of 7-, 8-, 9-, and 10-sided polygons. The kids and I looked at several examples of polygons and non-polygons, then the kids paired up and, by examining the shapes that were polygons, determined what rules a polygon must follow. 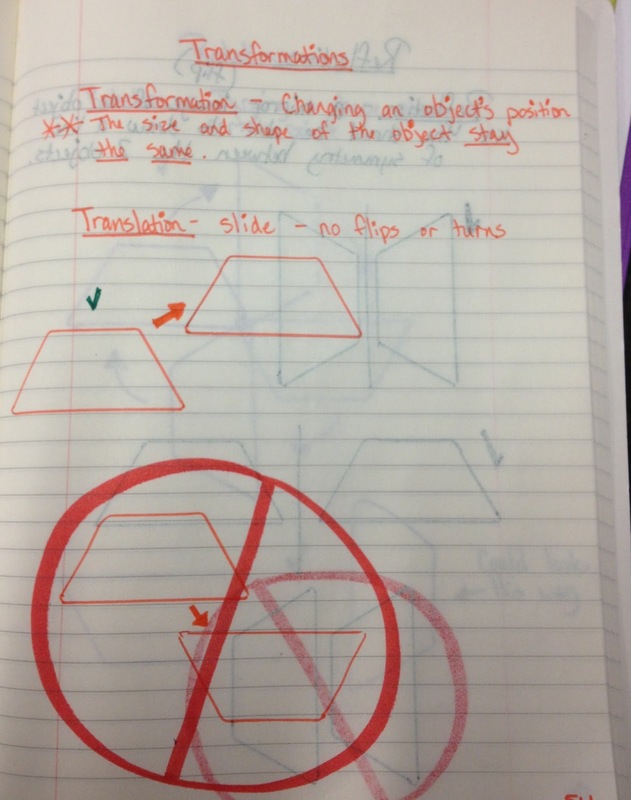 We made a list of our rules in our journals, then the kids were given 12 shapes to categorize as polygons or non-polygons. We added those to our journals as well.